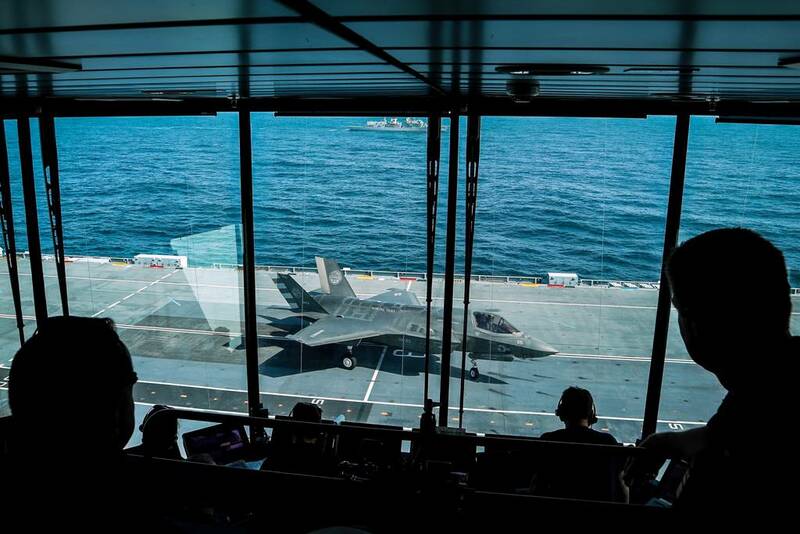 F-35 Lightning jets land on HMS Queen Elizabeth for the first time. 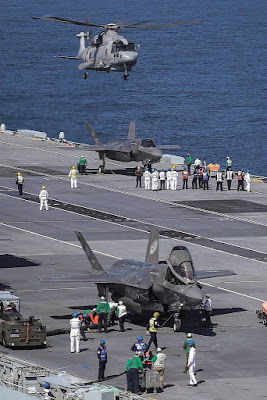 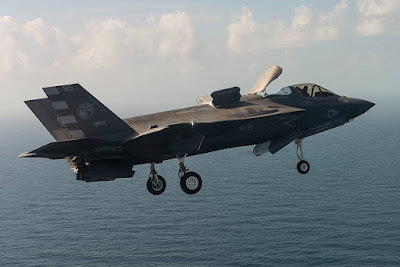 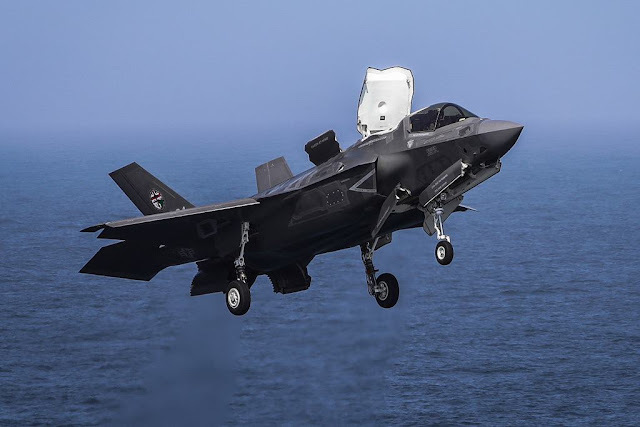 Royal Navy Commander Nathan Gray and RAF Squadron Leader Andy Edgell were the first pilots to make history by landing their F-35 Lightning stealth jets on the flight deck of Britain’s newest carrier. 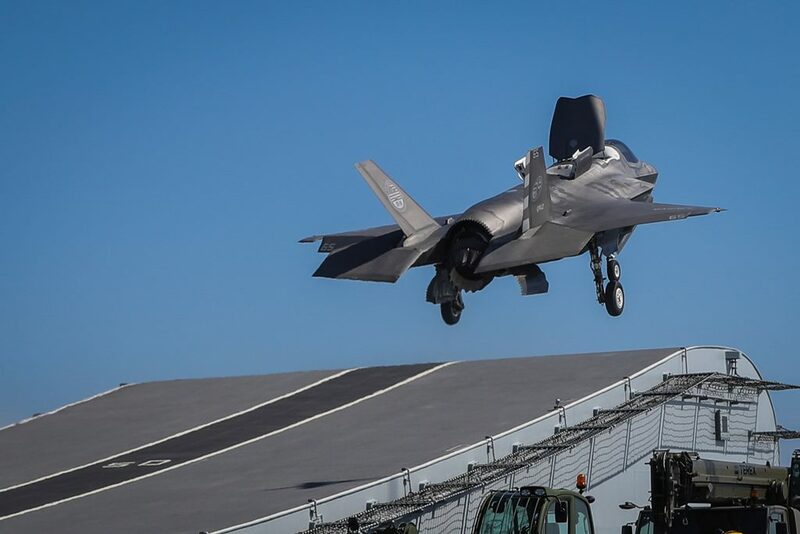 Shortly afterwards, CdrGray became the first pilot to take off using the ship’s ski ramp. The flying operations mark the start of more than 500 take-offs and landings set to take place from the mammoth warship over the next 11 weeks. 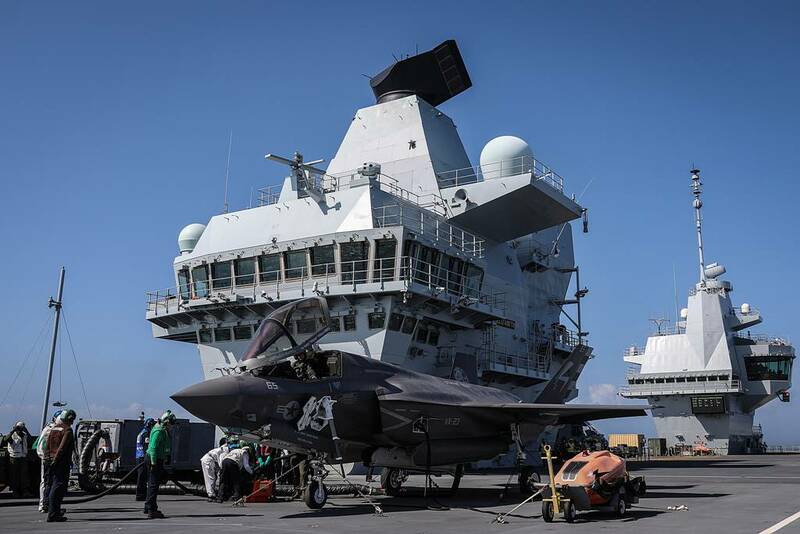 Speaking shortly after the first landing on Tuesday (25 Sep 18), Cdr Gray said: “No words can explain how it felt to turn the corner at 500mph and see HMS Queen Elizabeth awaiting the arrival of her first F-35 jets. 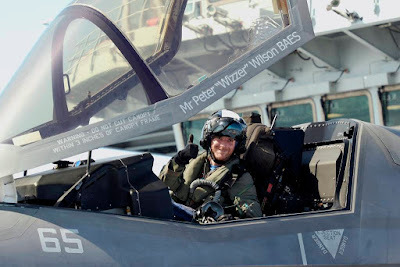 I feel incredibly privileged. 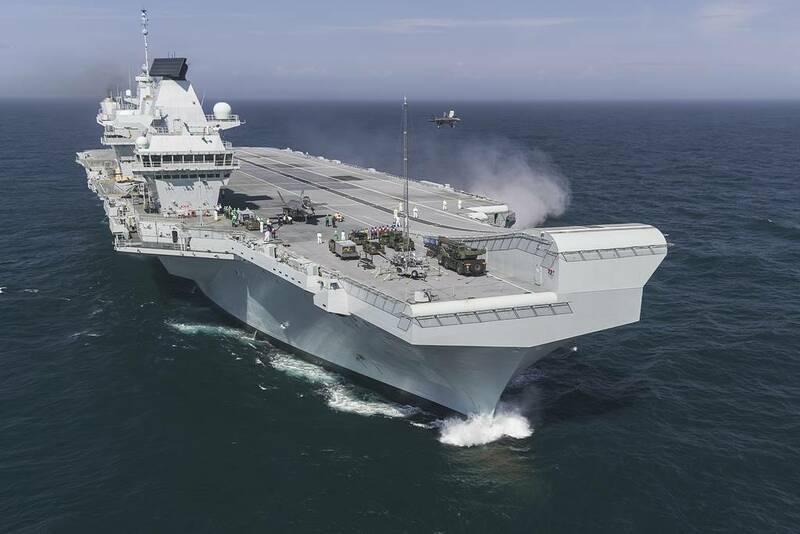 Able to embark up to 24 of the supersonic jets, HMS Queen Elizabeth provides the Royal Navy with a capability possessed by few others. The Commanding Officer of HMS Queen Elizabeth, Captain Jerry Kyd, said: “I am quite emotional to be here in HMS Queen Elizabeth seeing the return of fixed-wing aviation, having been the captain of the aircraft carrier which launched the last Harrier at sea nearly eight years ago. 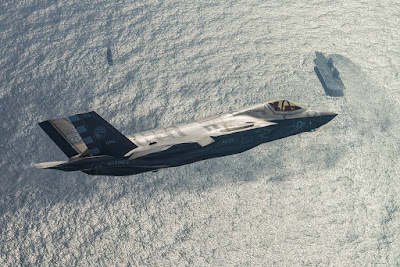 The deployment has also provided an opportunity for the UK’s Carrier Strike Group headquarters team to sharpen their skills in a task group, having been joined on the deployment by Type 23 frigate HMS Monmouth, and a US Arleigh Burke-class destroyer the USS Lassen.More than 1,400 sailors, flight crew and Royal Marines have been working on board the carrier during her deployment. F-35, offering an immensely flexible and potent combination to deliver military effect around the world. 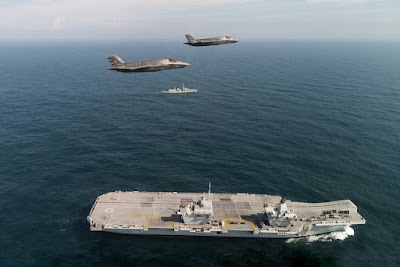 The Royal Navy’s two new aircraft carriers, HMS Queen Elizabeth and HMS Prince of Wales, will project British military power across the globe for the next half a century. Construction work continues at a pace on board HMS Prince of Wales, the second aircraft carrier in the class, which nears completion at the Rosyth shipbuilding yard.